This week, Your News to Know rounds up the latest stories involving gold and the overall economy. Stories include: Gold to remain an attractive hedge in current times, gold ready for a move to $1,455, and John Paulson and Ray Dalio stay loyal to gold. In spite of preparations by the Fed to hike rates two more times this year, gold investors can rest with the knowledge that the metal’s role in a portfolio will remain intact. According to an article on Financial Express, gold prices may have been subdued in April due to a stronger dollar, but numerous favorable factors will guarantee a return to the uptrend. As the Fed begins to unwind its balance sheet, the tightening of monetary supply is expected to affect the markets. Equity holders could be the first to feel the impact of less money in circulation, taking away any optimism that stems from recent tax cuts, improved liquidity and higher asset prices. Gold, however, would quickly thrive in this environment, as the soaring stock market was often cited as the metal’s biggest headwind in 2017. The rising aggregate debt in the U.S. could also lower the appeal of Treasuries, especially among foreign investors. Over the long term, the ballooning debt would also put the dollar’s recent upswing into question and diminish the currency’s long-term prospects. Bonds would further suffer if trade tensions between the U.S. and China escalate, a prospect that seems all but guaranteed given the rhetoric of both nations’ leaders. The introduction of higher import tariffs by the two nations has already brought some attention to gold, as lowered demand for U.S. assets could come in a time when the budget deficit is swelling. As global economic risks pile up, gold can once again be seen as the safest insurance against the coming tide. Adding the concerning geopolitical picture to the fold serves to further illustrate the importance of preserving a sensible allocation to the metal in every portfolio. While some gold investors might dread a dip below $1,300, one analyst welcomes it as a potential catalyst for a major jump in prices. According to Kitco, David Brady, CEO of Global Pro Traders, says he interpreted the move as a sign that gold is gearing up for a major breakout. “Gold is at or close to a low here that is likely to set off a rally to $1,360 or higher in the coming weeks,” he said. Brady is adamant that the metal will not go below $1,270, and a creep towards this support level would likely signal an immediate reversal. Past this, Brady sees prices going as far as $1,455 an ounce in the near term, amounting to a roughly 13% gain from current levels. The metal will be supported by weakness in the dollar, as the recent rally stands on weak legs and the currency is overbought. A return to the dollar’s downtrend would expedite gold’s move up, says Brady. The analyst also touched upon sentiment, which he believes is a key indicator of gold’s upcoming price action. “When everyone is bullish, that is typically the best time to sell, and when everyone is bearish, [that is] the best time to buy,” he explained. With the Daily Sentiment Index (DSI) showing “extreme bearishness” in the market, Brady believes now is the ideal time to load up on the metal as a significant rally could be right around the corner. 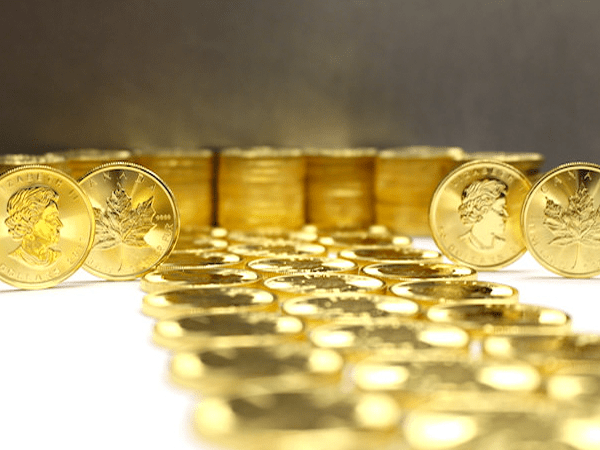 As rising interest rates go head-to-head with gold’s recent price gains, some of gold’s biggest supporters have doubled down on their position reports Bloomberg. Even amid the prospect of two additional rate hikes this year, billionaire hedge-fund managers John Paulson and Ray Dalio maintain their sizeable exposure to the metal. Data from a recent regulatory filing shows that Paulson’s spot in SPDR Gold was virtually unchanged compared to the end of December. Having closed 2017 with 4.36 million shares, Paulson’s allocation in the gold-backed product still sits at a hefty 4.32 million shares. The fund saw a major inflow of money in the first quarter of 2018, with $396 million poured into it over the course of three months. This brought holdings to their highest level since 2013. Ray Dalio’s hedge fund Bridgewater Associates has likewise stuck with the metal, having kept its stake in both SPDR and iShares Gold Trust, two of the largest bullion-backed funds. Dalio’s choice is hardly surprising, as the famed money manager ranks as one of gold’s staunchest supporters.